The Coalition was never supposed to last this long. Not according to the British public, that is. Three years ago YouGov asked voters how long they thought the Lib/Con alliance could survive. Almost half (47%) reckoned the two parties would by now have gone their separate ways. Only one-in-seven voters thought it would last more than four years. Voters aren’t always right. Last week’s Comprehensive Spending Review showed the Coalition will, almost certainly, endure until May 2015. (And if that fact makes ConservativeHome readers grimace, be assured it will pain a fair few Lib Dems too.) The heady ‘Dave♥Nick’ Rose Garden days are, of course, a distant memory. Remember the early talk, inspired by Nick Boles, of joint Coalition ‘coupon’ candidates? In reality, any remote possibility of a more permanent Lib/Con alignment was killed the moment George Osborne issued the command for the No2AV campaign to target Nick Clegg. The relationship since 2011 has been transactional, reaching its nadir last summer when the Lib Dems avenged the defeat by Tory backbenchers of Lords reform by scuttling the Tory leadership’s longed-for boundary review. Both sides spent a few weeks staring into the abyss before realising the Coalition remains their best hope, their only hope. Neither party’s sure what the next election will bring. 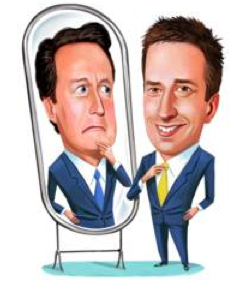 But both Cameron and Clegg know what an early election will bring: bad news for them both. Their pact of mutually assured deferral continues. When George Osborne stood up last week to announce the latest round of austerity cuts to public spending, it signalled two things. First, that the two parties have found a way of making the Coalition work (or at least ensuring that it functions). True, Vince Cable was last to settle with the Treasury, but settle he did with not so much as a hint of a scintilla of a whiff of a threatened resignation. The Quad delivered. Secondly, that both parties are sticking fast to their joint economic strategy: blame Labour. I’m almost (only almost) tempted to feel sorry for Eds Miliband and Balls. Just as nothing William Hague could do between 1997 and 2001 was able to erase the public’s collective memory of the previous Conservative government’s record, so nothing Labour can do will erase the collective memory that the nation’s finances spiralled out of control on their watch. It’s rough justice. After all, both the Conservatives and Lib Dems largely backed Labour’s economic approach at the time (remember the Conservatives’ pre-crash pledge to match Labour’s spending plans?). But no-one ever said politics was fair. Though governments are at the mercy of events, they can still make the political weather. For a decade, Labour successfully pitched to the electorate that better services required increased spending. Now the Conservatives, aided and abetted by the Lib Dems, are making the reverse pitch, and this time it’s Labour which has been forced onto the defensive. As polling expert Anthony Wells puts it: ‘people think the cuts are bad for the economy and being done unfairly, but they think they are necessary, and are more likely to blame Labour for them than the present government’. The Lib Dems and Conservatives are not just united by a common enemy, we’re also united by an oddly shared approach. While Conservatives make it quite clear they’d be prepared to cut faster, harder if it weren’t for those pesky Lib Dems holding them back, my side of the Coalition, well… we make the same point, actually: that the Lib Dems are anchoring the Coalition in the centre ground. This suits us perfectly: the party’s whole strategy for 2015 is based on the fact that, when it comes to the crunch, the public won’t trust Labour enough on the economy and won’t trust the Conservatives enough on public services. It’s a risky slogan — ‘Vote for us, we’re total anchors’ — but it might just work. George Osborne’s statement to the Commons announcing the CSR was explicitly political, with immigrants and welfare squarely in his sights. A dog whistle here (cutting the benefits of non-English speaking claimants if they refuse to learn English — though the evidence shows migrant workers are mustard-keen to learn English), a dog whistle there (all unemployed claimants having to wait seven days to claim financial support). The polls consistently show the public wants the government to get tougher on ‘scroungers’, so it makes electoral sense, yes? I’m doubtful. While each of his measures might individually be popular, taken together they suggest a Conservative party that’s retreated to a core vote strategy, has given up on reaching out to the 40% of the public it needs to persuade. And we know what happened when they tried that tack in 2001. And again in 2005. With the Conservatives in pursuit of their lost Ukip vote, you might expect the Lib Dems to turn to Labour. After all, Ed Miliband has been moving his party closer to the Lib Dems’, with the promise of continuing the party’s policy of tax-cuts for the low-paid, the introduction of Vince Cable’s ‘mansion tax’, and adopting Nick Clegg’s proposal to end winter fuel allowance for wealthier pensioners. However, as Labour edges towards the Lib Dems, so my party is upping the ante in its attacks on Labour. In the last week alone, Danny Alexander has slammed Labour’s pensions policy, David Laws finally published that infamous hand-written note by Liam “there’s no money” Byrne, and Nick Clegg demanded that Labour ‘apologise to us for the brutal accusations they laid at our door while we were cleaning up their mess’. It doesn’t sound much like the start of a Lib/Lab love-in. But the closer parties are, the louder they shout. The obvious truth is neither the Conservatives nor Labour want to have to deal with the Lib Dems after 2015. Ask their respective memberships, and I suspect there would be an overwhelming desire to ignore the ‘Yellow Peril / Yellow Tories’ and plough ahead as a minority government. But as their respective leaders know only too well, that will give immense power to a handful of back-bench MPs. Just as David Cameron in May 2010 didn’t want to spend all his time placating right-wing Eurosceptic MPs (that worked out well…) neither would Ed Miliband want to rely on Unite-sponsored Labour MPs in 2015. One or other of them may have no choice but to turn to the Lib Dems, though. Loathe us or loathe us, you might find these Yellow Anchors are holding power for a few more years to come.